The Karisia Hills start to come into focus as we leave Mugie Conservancy and head north to Samburu County, Kenya. I am hosting a hiking and camping trip, trekking in the Karisia Hills. Trundling along the dirt road, dust occasionally wafts in through open windows as another car passes, as well as the sights, sounds, and smells of the bush. An unchanging, blurred blue when seen from a distance, it is hard to believe that the fine details of the Karisias – the three-dimensional peaks and valleys and forests – actually exist. As we drive, we are met by warm smiles and friendly waves from the people we pass. Rather a lot of people in fact, as it is Sunday and it seems that everyone is on their way home from church, including the high school girls from the boarding school in their neatly pressed blue and yellow uniforms and the villagers wrapped in tartan blankets and decorated with beads – as is the Samburu style. We turn east off the main road and barren flats give way to patches of thickening forest. The acacia trees here are in bloom – decorated with a dusting of light-yellow flowers, they emit a faint and delicate aroma. Not at all in keeping with the spiked trunks and branches of their trees. We stop just past a small dam, dried up to just a pocket of water in the centre, where children are trying to catch catfish. 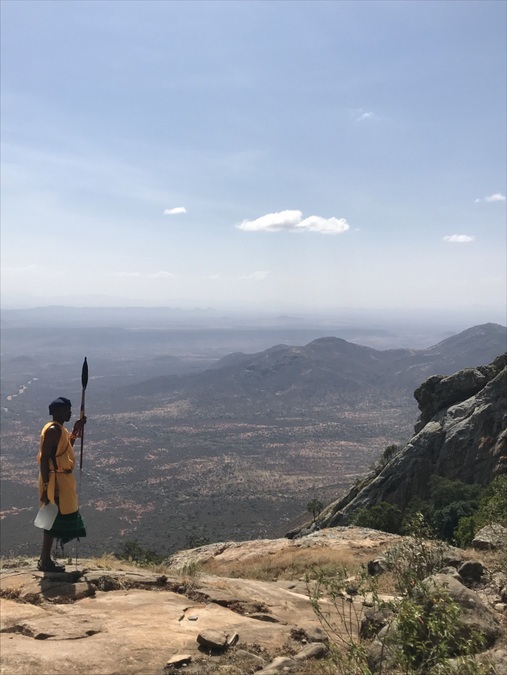 We meet our Samburu guide, Losolombo (also known as ‘GPS’ because he knows the land like the back of his hand – every tree, rock, and spring is familiar to him). Weathered and wise, and speaking only Samburu and a bit of Swahili, he is the real deal. Climbing out of the car, we decide to take a short stroll to our stretch legs before our picnic lunch. I am first enthralled by an elephant skull – it seems rather out of place to see something once so magnificent askew on the ground. 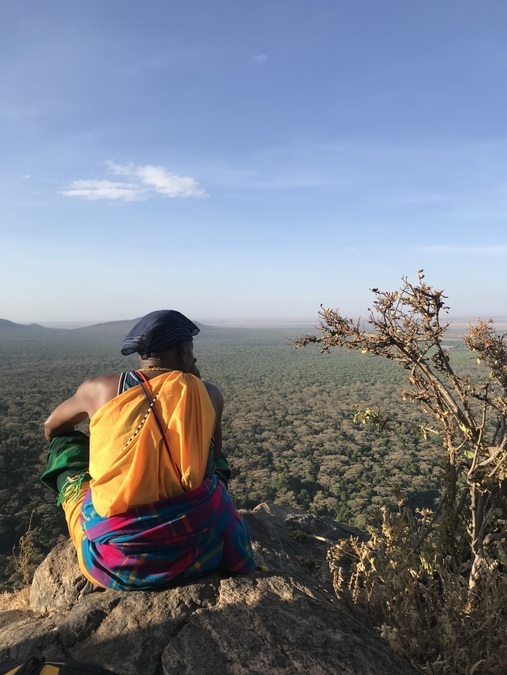 Guided by Losolombo and our guides from Ekorian’s Mugie Camp, Ekwam and Patrick, we see leopard tracks and learn about the traditional uses of the trees and bushes. We return for lunch, gathered around the bonnet of the car, and then the guests head off walking with Losolombo and Patrick, while Ekwam and I go ahead to our campsite with ensure everything is in order for their arrival. We follow a black cotton soil goat trail – I am very glad it hasn’t rained in the past few days as it would make the way very tricky! Black cotton soil is known for being sticky and slippery – impassable when wet. A local guides us, thank goodness, as I can’t imagine being able to discern the way through the forest. The Ekorian team had already arrived earlier in the morning to set up camp, and when I arrive I find it truly magnificent – A-frame tents set in a semicircle, as well as a mess tent and a kitchen tent. A campfire ready for lighting, fairy lights ready to turn on, and the roast chicken we’re having for dinner is already roasting and sending delicious aromas around camp. The guests arrive soon and after a cup of tea, all retreat to their tents for reading and relaxing. The sound of gentle cowbells is a constant, tinkling lullaby, and with the warm afternoon and gentle breeze, the combination is soporific. The evening is magical – a short walk to explore the valley in which we’re camped, gin and tonics by the campfire, and then an unbelievable dinner of roast chicken as we sit under the twinkling blanket of stars. Planning an early wakeup, we retire to bed quite early, the chirps of cicadas, the hoot of an owl, and the far-off chattering of baboons and snuffles of bush pigs, our bedtime story. In the morning, tea and coffee follows a wake-up call from the smiling Epak. And then we’re on our way, starting with a steep ascent to the ridge. We can feel the altitude tightening our lungs but push on amid the chatter of parrots and the croak of the turaco birds (Musophaga rossae). Their feathers, a vibrant red and blue, are a bread-crumb trail dotted along our route. Blue sky and sunlight show through the trees and a wave of utter joy washes over us as we clamber out of the woods and onto the rocky outcrop at the top to take in the breathtaking view to the south of us. We can see baboons skittering out of sight, a tawny eagle soars below us, and we spot leopard and hyena tracks. 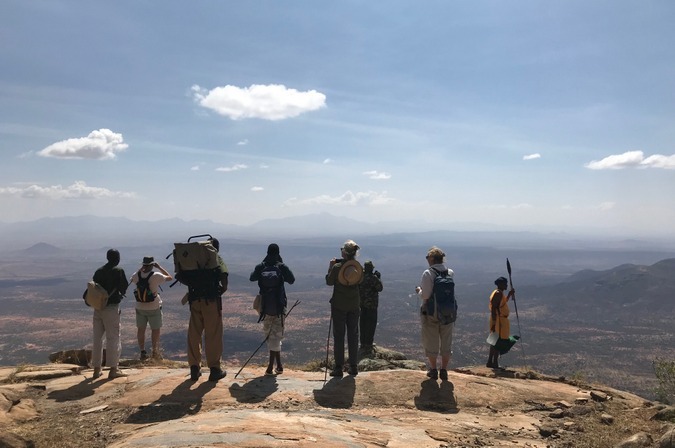 We perch on the rocks to bask in the sunlight and take in the sweeping view down toward the Laikipia plateau. After a bit, we re-enter the forest and the mottled shade, following Losolombo and the trail upward along the ridge. It’s heating up now; the jungle is starting to steam. We tread quietly on soft earth, the sweet, tangy smell of mulching leaves wafting up from the undergrowth. There are signs of cows passing through here, and sure enough, the now familiar sound of cowbells soon becomes audible. We come upon herds, released from their bomas to graze and moved towards the wells that this area is known for. Spring-fed, the wells are nestled in the dips and folds of the hills. They’re called ‘singing wells’ as each herder has a unique song to call forward their herd of cattle to drink, and in the dry months, when the wells are more frequented, the valleys resonate with the soft, melodic Samburu songs. As we climb out of the valley and onto the ridge, the view to the north peaks out through the trees. Wide, sweeping, vast, and barren. It’s quite a juxtaposition – our view of a desert from our vantage point in this dense and verdant tangle of trees. Suddenly, the forest spits us out onto a rocky outcrop. Staggering views surround us – we’re on the highest point of the Karisia Hills and flat, desolate land extends below, as far as the eye can see. Vereaux’s eagles soar on thermals, swirling around us like ribbons of ink. It seems out of place, but we’re surrounded by cows. What a place to graze your herd, a vista that makes one feel miniscule. After sitting in wonder, we eventually retreat to the shade of the boulders to eat our picnic. Later, as we stand up to pack, limbs feeling a bit stiff as we rally to action, an enormous storm cloud is sweeping toward us, sheets of rain connect cloud and earth. We debate whether to shelter under the rocks and wait for it to pass or make for the woods with haste. The unquestioned knowledge of Losolombo wins out and we head for the trees. It’s downhill now, moving swiftly over the forest floor, dodging rocks, tree branches, and bushes. We can hear the scampering of baboons ahead as they skitter away from us – intruders into their wooded world. On the heels of Losolombo, I move with uncharacteristic speed and grace down the hillside. It earns me the highest of compliments from Ekwam, our Ekorian guide who I’ve known for years, when he calls me a ‘moran’. A term used to describe young men when they pass into the stage of warriorhood – I overlook the fact that it is a male term, I know what he means. About an hour later, after our descent from the hills, passage across a valley, and as we re-enter the forest, the rain catches us. The bellows of thunder have been making a mighty threat and the storm delivers – the heavens open and a torrential downpour is unleashed. We seek shelter under crooked tree trunks and their skimpy branches, but quickly see that this offers little protection, and opt to carry on. It’s the usual thing, once all reserves of hope to stay dry are foregone, the pelting rain becomes quite cathartic. Drawing us back to childhoods of mud puddles and soaked clothes. The soul-cleansing shower continues as we follow Losolombo, dodging the rivers of water that crisscross the path. Thank goodness we have him as he leads us through terrain that we wouldn’t have a hope of navigating, even if we could see more than a few metres in front of us. Suddenly, we are standing on the ridge behind camp. The promise of tea pulls us forward as we pick our way down the slope. We are met by the smiling faces of our team, offering hot drinks and brownies! The downpour subsides as we relay the day’s adventures and thank Losolombo and our escorts profusely. 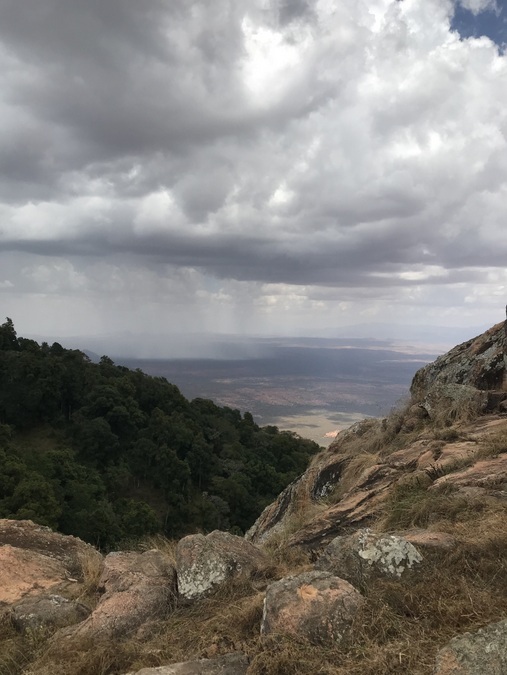 But we want to get on the road before the rain has made too much of an impact – making the soil especially slippery or washing away the track, so we pile into the safari car. We take an alternative route to avoid the treacherous black cotton soil. Tired and thoughtful, we are quiet as we make our way back to Mugie, and the warm showers and dry clothes that await us at Ekorian’s Mugie Camp. It’s only been 36 hours, yet this quick getaway was a reinvigorating departure from ‘real life’ and just what was called for. Ekorian’s Mugie Camp is based at the heart of The Mugie Conservancy in Northern Laikipia, Kenya. Ample activities keep the whole family entertained, while the conservancy boasts abundant and diverse populations of birds and wildlife. An enriching safari experience!